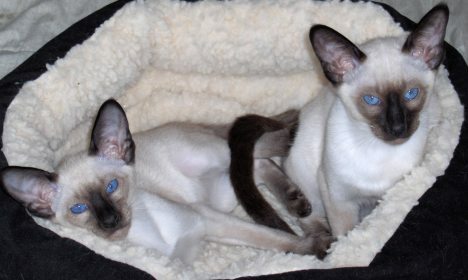 Siamese kittens for sale at Suyaki Siamese Cattery, a purebred Siamese cat breeder located in Florida. 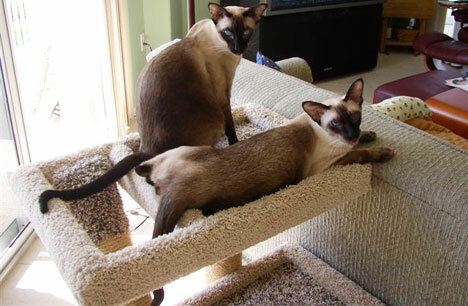 Suyaki Siamese is a CFA registered cattery based in Miami, Florida. vaccinated, and their health is guaranteed. a shipping carrier is always included in the cost of the kitten. Shipping is an additional charge. area may pick up their Siamese kitten in person. or neutered, to loving indoor homes at a reasonable price. I have enclosed a recent photo of Coco on her “throne” in her velvet bed that she has almost outgrown. She is the light of my life and I am considering adopting a sister for her this Christmas. I also wanted to thank you once again for creating a wonderful animal. Nico is a treasure. He is very affectionate, devoted, and intelligent. He is without a doubt the best cat I ever had and my best friend. Prince Bhumibol continues to overwhelm us with his personality and intelligence. He has come when called from Day 1, and used scratch pads both vertical and perpendicular from Day 2. He is so affectionate! With all those attributes he should be able to win over 3 year old female cat soon. There has been no indication he misses being with his litter mates. He fit in immediately. Right now he is sitting on my lap – a total love. Do we sound like thrilled new “parents”? We have returned to Florida for the winter with our Kitten. Not only are we completely devoted to him, but everyone who meets him immediately recognizes a highly social, affectionate Siamese cat. He has an outstanding personality; a shiny, shiny coat; and muscular physique.